Is it ART, or is it Just Plain Tacky? In this class, you will be making a small firestorm, totally imaginary and completely beautiful in its shimmering glory. This is a study in layers, with painted background trees, fused canopy, layers of sheer fabrics, Angelina and Tintzl fibers, burnt-edge trees, and more fibers, all covered by tulle and fused with Bonding Agent 007. Very HOT! Click here to reach Cool Stuff Resources Guide! Foreground branch fabric (wood cheater fabric works well), preferably in burnt-tree colors (black or brown with orange/red). 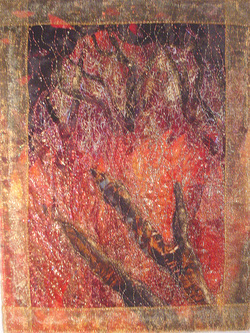 Small scraps of flame colored fabrics: gold, orange, red, yellow – batiks or cottons or whatever you have around is fine. Sheer Fabrics. You need a few sheer fabrics that you can rip, tear, shred, for a total of about 10 small pieces or red, black, or gold tulle; cheap chiffon scarves in the same colors; sheer metallics; crinkled metallic silk; fabric made of bronze or gold metallic fibers; sheer fabrics in flame colors like orange, gold and red, gray; any other transparent, whispery, shimmery fabric will help as long as it will overlap with transparency over other layers.